Global governance is a system of complex interactions and interdependencies between a variety of state and non-state actors. It encompasses issues ranging from conflict resolution and nuclear non-proliferation to international development and global health. Developed mostly by Western states, it is embedded in Western values – such as individual human rights, and the Western vision of a rule-based international order. In simpler terms, global governance may be understood as a ‘division of labour’ and the ‘specialization’ of particular actors in international affairs. Russia and China take part in global governance processes with differing levels of intensity.1 This variance stems primarily from their material capabilities, extent of integration into the world economy, and the way both governments assess their state’s dependence on ties with the external world. Importantly, Moscow and Beijing are not entirely comfortable with the very concept of global governance. To many Russian officials and scholars, the concept itself is ‘Western’ and should be contested or even rejected. Some Chinese academics and officials also approach the concept with scepticism due to its Western roots.2 Nonetheless, Beijing and Moscow declare their willingness to be engaged in certain aspects of international governance and global public goods provision, although they differ when it comes to the areas in which they are active participants. undermine the other’s participation in global governance and threaten their ability to achieve distinct goals? Do their patterns of participation in global governance facilitate or pose an obstacle to long-term Sino-Russian cooperation? At first sight, there are many points of convergence between Russia and China, the most important of which include: the conviction of both states’ ruling elites in their special responsibilities as great powers; membership of key international institutions giving both states a seat at and a say in major global fora; shared views on those aspects of international politics that should be contained or rejected; almost identical rhetoric with regard to the primacy of the United Nations and international law, as well as the need to ‘democratize’ international relations. The point of departure for Sino-Russian normative convergence is the shared idea of entitlement to a privileged position in international politics. Both states emphasise their unique global roles, especially with regard to the areas of international security and conflict resolution. 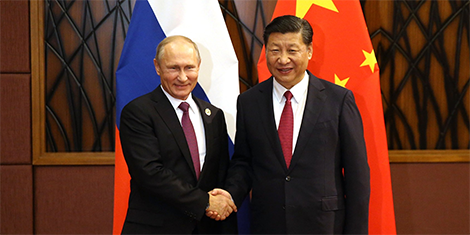 Joint Sino-Russian declarations that are adopted at annual summits usually provide a catalogue of their agreed positions with regard to ongoing conflicts, as well as challenges to global and regional security. International security is interpreted by Moscow and Beijing through a state-centric lens and with a clear focus on territorial integrity and regime security. Both states tend to support incumbents in domestic conflicts and civil wars. Regular condemnations of ‘external interference’ are usually aimed at Western policies towards particular conflicts. Membership of key global institutions, most notably the permanent seat in the UN Security Council, enables both states to influence the global agenda. Common opposition to the human rights agenda and democracy promotion by the West is reflected throughout UN organs in their voting patterns, including in the UNSC and Human Rights Council.5 Apart from cooperation in the existing institutions, Russia and China have been working to create a parallel institutional setting on a global scale, first and foremost by establishing the BRICS forum. Judging by the number of areas in which Russia and China have similar views, one might expect them to cooperate closely in the realm of global governance. Despite increasing normative convergence, however, both states portray their roles in the international arena in different ways. Two notable statements by both states’ leaders symbolize this discrepancy: Vladimir Putin’s speech delivered at the Munich Security Conference in 2007 and Xi Jinping’s speech at the World Economic Forum in Davos in 2017. The Russian government’s message to the world remains grounded in Putin’s Munich speech. Moscow presents itself first and foremost as a great power and a bulwark against US dominance and the world order that it identifies as unipolar. Russia seeks affinity with all actors dissatisfied with US policies. This message has been repeated regularly, the most recent example being Putin’s 2018 address to the Federal Assembly, where he showcased Russia’s military prowess and reaffirmed its readiness to resist the US. This approach overshadows other attempts to present Russia as a relevant economic actor that have been undertaken at such events as the Saint-Petersburg or Vladivostok Economic Forum. China, in turn, focuses on projecting a benign image of itself. This self-branding is best represented in Xi Jinping’s Davos speech. Using Donald Trump’s protectionist rhetoric as a counterpoint, Xi portrayed China as a defender of economic globalization and presented China’s development as an opportunity for the world. Beijing wants to appeal to both developed and developing states. On the one hand, it continues to emphasise that China is still a developing country. On the other hand, the elite emphasise that China has gained capabilities to share the effects of its economic growth with others and deliver where Western states fail to do so. Such a narrative does not mean that China shies away from demonstrating its military power, as proved by the growing global presence of the PLA Navy, including its participation in joint naval drills with Russia in the Mediterranean and the Baltic Sea. The clear goal, however, is to impress the international audience with China’s economic success rather than with its military might. When Xi Jinping referred to international security issues, speaking for instance at the 2014 Conference on Interaction and Confidence Building Measures in Asia (CICA), he couched Chinese political-security goals in the language of win-win cooperation and emphasised the inclusive nature of Chinese proposals in the realm of security. These self-representations by China and Russia are not mere PR exercises. Rather, they reveal deep differences between Moscow and Beijing in their attitudes towards the existing global order, as well as divergence in their long-term aims. While Beijing remains dissatisfied with certain elements, particularly US primacy, it recognizes the benefits that China derived from the post-Cold War period.6 The Russian ruling elite, in turn, does not regard the current arrangements of the international order as beneficial to Russia’s great-power interests. As a consequence of these differing attitudes, China prefers an incremental shift in international hierarchies that would empower Beijing. The change in the global order should neither undermine general political-economic stability, nor harm economic openness. Moscow, in turn, appears determined to regain its privileged position in the short-term perspective. It is ready to fuel populism and the anti-globalist and anti-elitist agenda, seeking to fulfil its parochial aims to enhance its own international position by exploiting the increasing unpredictability of international politics. The expectations that the outside world has towards Russia and China coincide with these different self-narratives. Negative assessments of Russia’s participation in global governance are predominant in the Western analytical discourse, where the Kremlin is regularly depicted as attempting to subvert the existing international order. Indeed, Western expectations concerning Russia’s contribution to global governance have hit a nadir in recent decades. The non-Western world, on the other hand, views Russia mostly in terms of its potential contribution to counter-balancing the US. In the case of China, many Western and non-Western observers acknowledge that China simultaneously accommodates and poses a challenge to global institutions. The debate over China’s rise oscillates between regarding China as a threat and seeing it as an opportunity. Some doubt the country’s willingness to contribute to public goods globally, but nonetheless the pressure on Beijing to become more active and share the burden of global governance is steadily rising. Three areas illustrate the growing discrepancy between China’s and Russia’s engagement in global governance: participation in UN peacekeeping efforts, the contribution to development cooperation, and the fight against climate change. They also show how Russia’s level of activity decreased, whereas China gradually became more active. The level of participation of Chinese troops in peacekeeping operations has been steadily increasing for the last decade. China provides several thousand troops for missions of this sort (from 2,300 to 3,000 in 2015–2017).7 Even if more meaningful engagement coincides with China’s narrow commercial interests – as, according to critics, is the case in sending peacekeeping troops under the UN aegis to South Sudan – Beijing is becoming more involved in efforts with uncertain outcomes.8 Russia, meanwhile, has practically withdrawn from any participation in UN peacekeeping operations, seeing them neither as increasing its international prestige, nor as bringing tangible benefits. The last Russian mission under the UN aegis took place in 2006 in Lebanon. Both Russia and China have been participating in anti-piracy missions in the Horn of Africa since 2008, however. Development cooperation provides another illustration of the changing roles Russia and China have played in global governance. Russia attempted to set up a separate national development assistance institution in 2007 when it adopted its first development cooperation strategy (updated in 2014).9 Following several years of bureaucratic turmoil and the global economic crisis, the Kremlin decided to hand over development issues to the Federal Agency for the Commonwealth of Independent States, Compatriots Living Abroad and International Humanitarian Cooperation, commonly known as Rossotrudnichestvo. Handing over the development cooperation portfolio to an agency responsible for cooperation in the post-Soviet space attested to the limited regional scope of Russia’s ambitions. Between 2010 and 2012 Russian official development assistance (ODA) hovered around USD 500 million and exceeded USD 1 billion in 2015 and 2016 (figures include debt cancellation). The bilateral ODA is 75% of overall ODA. Russia’s development assistance remains concentrated on the post-Soviet space, with Kyrgyzstan, Armenia and Azerbaijan being the biggest recipients.10 Following Russia’s support for Bashar al-Assad’s regime, Syria emerged as the most recent recipient. China’s development assistance is global in scope and provides developing states with more substantial financial resources, although it sometimes leads to a debt trap for particular recipients. Beijing prefers to finance the construction of infrastructure, with a focus on African states. According to the OECD, China’s ODA in 2015 was USD 3.1 billion, of which more than 90% was distributed via bilateral channels. Other assessments provide higher estimates but the details of particular agreements are quite rarely released publicly. This generous policy does not preclude some negative effects as states supported by China are still prone to enter the debt trap, as in the case of previous Western and Soviet assistance. Nonetheless, China’s growing experience in development assistance and plans for broadening it led Beijing to establish a national development assistance agency in 2018. Climate change is yet another area that highlights differences in Russia’s and China’s participation in global governance. Back in 2004, the EU supported Russia’s bid for WTO membership in exchange for Moscow’s participation in tackling the issue of climate change. In 2009 China blocked the emergence of a new climate agreement, only to facilitate one in 2015. Beijing has duly emerged as the European Union’s major interlocutor, replacing Russia in this role. The realm of arms control and disarmament – one in which Russia played a unique role, on a par with the US – also reveals changes in how Moscow and Beijing contribute to the provision of global public goods. Russia remains a crucial participant in global and regional arms control and arms reduction agreements, while China restricts its participation to a minimum. However, the US’s gradual withdrawal from arms control agreements, followed by growing Russian-Western tensions, have made Moscow less interested in maintaining the existing security architecture. To this end, Russia has withdrawn from conventional arms control regimes, such as the Treaty on Conventional Forces in Europe (CFE). It is possible that the remaining Russian-American treaties, such as the Intermediate-Range Nuclear Forces Treaty (INF Treaty), and the New START will either expire or one of the parties will decide to withdraw. The leading role played by Russia and China in establishing the BRICS group suggests that Moscow and Beijing aspire to create an alternative global institutional setting. BRICS states set up the New Development Bank and the reserve fund, while regular meetings are taking place at the level of BRICS finance ministers, central bank governors, trade ministers, ministers of science, technology and innovation, trade councils, business, and financial forums. Russia and China highlight the potential of BRICS as a forum for representing non-Western states, but they have not devoted substantial resources to developing its institutional capacity. As well as cooperating with Russia on BRICS, China is pursuing its single-authored institutions aimed at helping Beijing shape global governance. The most successful step to date was the creation of the Asian Infrastructure Investment Bank (AIIB) in 2015. More than 50 states, including Russia, joined the bank as founding members.11 China has also set up formats for regional cooperation, such as the 16+1 with Central and East European states and the Forum on China-Africa Cooperation (FOCAC). Moscow’s institutional footprint outside the post-Soviet space remains negligible. The Russia-authored initiative, the Eurasian Development Bank, which was established more than a decade ago, remains limited to the members of the Eurasian Economic Union. Russia’s and China’s defiance of Western primacy in international politics provides a solid basis for their cooperation. They distrust the West, and agree on which policies pursued by the West to oppose. Their views diverge on the expected shape of the world order to be achieved after the US unipolar moment, however. This difference is particularly acute in the ways in which they participate in the realm of global governance. Russia’s low level of activity and limited participation in global governance do not have to pose an obstacle as far as China is concerned. Beijing has sufficient economic resources at its disposal to actively shape global governance practices, while Russia in most cases does not have much to offer apart from political support, which, in itself, may be counter-productive. However, it is Russia’s instigation of instability that may indirectly harm China in the long-term perspective and emerge as a key obstacle to deeper strategic cooperation. Notable recent examples include the conflict with Ukraine, which effectively closed off one of the possible routes for China’s Belt and Road Initiative, coupled with Russia’s support for anti-establishment and populist movements worldwide. In this respect, protectionist economic policies and a xenophobic mood can be far more detrimental to China’s interests. With its limited economic presence abroad and only sectoral participation in the global economy, the Kremlin may feel encouraged to resort to political brinkmanship. Moreover, Moscow’s support for new global and regional institutions promoted by China, such as BRICS or the AIIB, would not compensate for China’s losses from the backlash against globalization. 1 For broader analyses of China’s participation in global governance, see e.g. Scott Kennedy (ed. ), Global Governance and China: The Dragon’s Learning Curve, Routledge 2017; Lye Liang Fook, “China and Global Governance: A More Active Role on a Selective Basis”, China: An International Journal, 15(1), 2017. For an assessment of Russia’s role, see for instance Roger E. Kanet, “Russia and global governance: the challenge to the existing liberal order”, International Politics, 55(2), 2018; Elena Belokurova, “A Russian Perspective on Global Governance” in: Global Governance from Regional Perspectives: A Critical View, ed. by Anna Triandafyllidou, Oxford University Press 2017. 2 David L. Shambaugh, China goes global: The partial power, Oxford University Press 2013. 3 Julien Nocetti, “Contest and conquest: Russia and global internet governance”, International Affairs, 91(1), 2015. 4 François Godement, Moritz Rudolf, Marc Julienne, Marie-Hélène Schwoob & Kata Isenring-Szabó, The United Nations of China: a vision of the world order, China Analysis, ECFR, April 2018, http://www.ecfr.eu/page/-/the_united_nations_of_china_a_vision_of_the_world_order.pdf, last accessed 15 August 2018. 5 Russia and China have jointly vetoed UNSC resolutions eight times in the post- Cold War period (six of which were in relation to the Syrian civil war). 6 Shaun Breslin, “China’s global goals and roles: changing the world from second place?”, Asian Affairs, 47:1, 2016, pp. 59–70. 7 The number is still lower than contributions made by many smaller states, which reach up to 6,000–7,000 troops, but stands out compared with other UNSC permanent members: France and the UK at the level of 700–800 troops, with Russia and the US contributing less than 100. 8 Godement, Rudolf, Julienne, Schwoob & Isenring-Szabó. 9 Kontseptsiya gosudarstvennoy politiki Rossiyskoy Federatsii v sfere sodeystviya mezhdunarodnomu razvitiyu (utv. Ukazom Prezidenta RF ot 20 aprelya 2014 g. N 259), http://www.mid.ru/foreign_policy/official_documents/-/asset_publisher/CptICkB6BZ29/content/id/64542, last accessed 15 August 2018. 10 Yu. Zaytsev, A. Knobel, “Ekonomicheskaya pomoshch Rossii drugim stranam v 2016 godu”, Monitoring Ekonomicheskoi Situatsii v Rossii, No. 17 (55), 2017, pp. 14–18. 11 Some analysts argue that China exerts much stronger influence with its unilateral actions. State-owned Chinese banks, such as China Development Bank or Exim Bank, offer more loans than the AIIB or the New Development Bank. Hameiri, Shahar, and Lee Jones, “Rising powers and state transformation: The case of China”, European Journal of International Relations, 22 (1), 2016. Marcin Kaczmarski is Senior Research Fellow at the Finnish Institute of International Affairs.